We gather at 10:30 a.m. on Sunday mornings to find meaning and deeper connections in our lives. Together, we contemplate wisdom from many sources, including religious texts, poetry, literature, and philosophy. During most services, we offer Religious Education classes for youth in preschool through high school. Other services are designed for all ages to enjoy together. We have a cry room in the back of our Sanctuary provided for infants and caregivers, and we offer a staffed nursery for children up to age four. 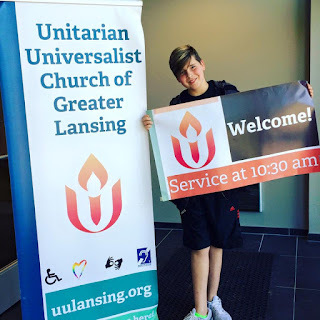 All are welcome to join us for worship at 5509 S. Pennsylvania Ave. in Lansing. Our worship services are American Sign Language interpreted, and our Sanctuary is equipped with a Hearing Loop System and headsets. Braille and large-print hymnals are available from the ushers. Our church is wheelchair accessible. If there is any other accommodation that would help you participate more fully in the life of our congregation, please contact us. There is no dress code at our church. Most congregants wear casual clothing, while some choose to dress up. You are welcome to “come as you are,” wearing anything that is comfortable for you. After each service, we gather for coffee and conversation. Our Atrium and Social Hall offer information for newcomers as well as everyone who would like to know more about what’s happening at church. Welcome and Membership classes are offered throughout the year, for those who would like to learn more about our faith tradition and our church. At most c offee hours, volunteers sell packages of our Fair Trade coffee and other treats in the Social Hall. Our volunteer-run Book Shop sells used books and music just off the Atrium. Our volunteer Hospitality Teams are present to serve as ushers and greeters, provide coffee and other refreshments, and assist congregants in a variety of ways. 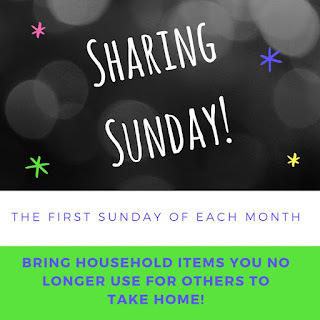 The first Sunday of each month is Sharing Sunday, when there are tables set up for congregants to donate and/or take items, including produce and dry goods. This is a way for us to reduce waste and strengthen our community by repurposing and sharing items we do not need. Everyone at church is welcome to leave items, take items, or do both. Items that are not taken home that day are donated to other local organizations.